Tonight I was working on the head and foot boards of a loft bed. 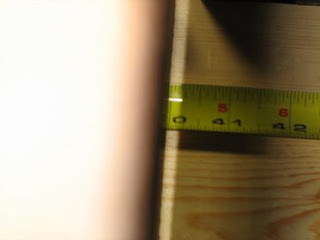 The rough dimension of the boards connecting the posts is 40". 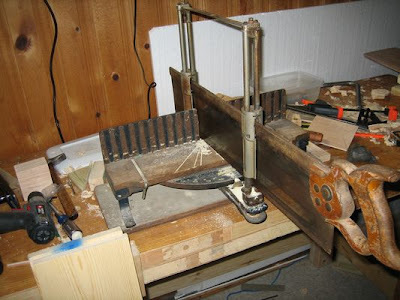 I learned a trick that is probably quite well known among the miter saw literati. You can sight down the side of the saw plate to a line on a tape measure with extreme accuracy. Here is a picture that actually came out quite well. I cheated the 40 line over a tad so it would show up well in the photo. Yes, I know it is just as easy to mark the wood and simply set the saw down on the mark. However,this way I can leave the saw locked in the up position and maneuver the board freely underneath. My mallet signed by Roy Underhill snuck into the frame above. No, I'm not name dropping--he doesn't know me from a pile of cedar sawdust. But I am proud of the mallet for it's round shape toward the head. 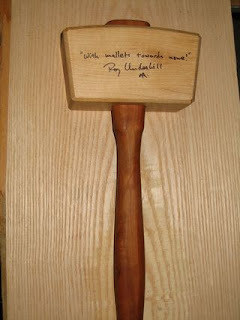 I gushed about this mallet on my previous blog and will repost the sentiments now. My previous mallet was a simple affair made by me. Basically it is a hunk of wood with stick stuck in the side. 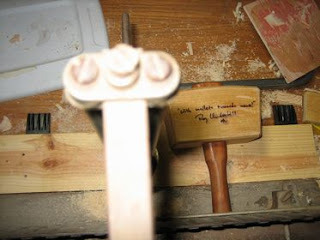 I found the above mallet at Woodworking in America 2010 offered by Blum Tool company. The unique thing about this mallet is versatility. The rounded shape near the head provides the perfect grip surface for finely controlled taps; the bottom of the haft is still shaped for delivering a wallop when needed. I willingly parted with 40 bux for this mallet. EDIT: Here is a larger picture of the mallet per request. Better pics available on the Blum site linked above. When Does Pragmatic Become Stupid?